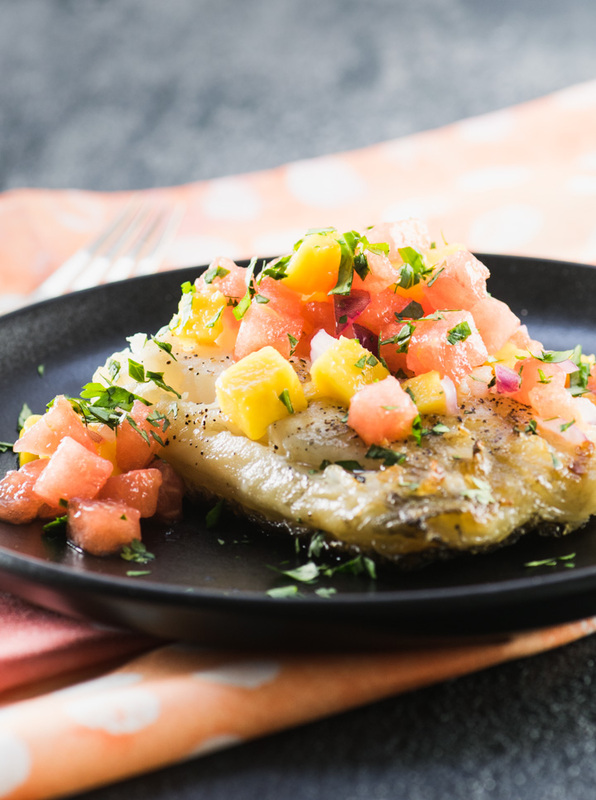 This grilled sea bass is topped with a light and refreshing watermelon and mango salsa, making it the perfect light summertime dinner! I grew up around a grill. My dad grilled year around, which is pretty common in California. I learned about how to grill at a pretty early age, though my dad is more fond of grilling with charcoal than gas so I had to learn about gas grilling once I had my own grill. Here in the Midwest when it’s hot and humid out no one really wants to fire up their oven to make dinner, so grilling is the perfect option. And this grilled sea bass with watermelon mango salsa is a great choice to add to your list of easy Summer dinner recipes. While a lot of people are pretty comfortable grilling chicken and burgers, I think grilling fish sometimes makes people a little nervous. With a little bit of prep and practice, you’ll find that it’s actually quite easy! As an added benefit grilled fish is super healthy and with a tasty topping like this watermelon mango salsa you’ll be sure to impress any dinner guests!! Taking these steps will help ensure you end up with perfectly grilled fish every time! Most importantly, you want to start with a really clean grill as fish tends to stick to the grates if you aren’t careful. Be sure you scrape off any old, burnt on bits so the grate is nice and smooth. Then you’ll turn the grill on to medium-high heat and let it warm up a little. Next, you want to oil the grates by taking a paper towel dipped in olive oil and rubbing in along the grates with your grilling tongs. You’ll want to do this several times until the grates get a bit glossy looking. You’re basically seasoning your grill this way. I actually recommend doing this frequently, even if you aren’t cooking fish as it keeps other things from sticking to the grill too. Before seasoning your fish pat it dry using a paper towel so there is no excess moisture when you put it on the grill. Then brush or spray both sides generously with olive oil. The goal is to achieve a slightly charred exterior to give your fish some crunch on the outside, so a thicker, firmer fish like sea bass can be cooked directly on the grate. Start with the skin side down first, placing the fish diagonally across the grates so it’s easier to lift when you are ready to flip it. Then reduce the grill temperature to medium, close the grill cover and don’t touch it! Let the fish cook for 3-4 minutes. You want the skin to be crisp before you flip the fish. Carefully flip using either two spatulas or a fork and a spatula. For whitefish cook for another 4-8 minutes until the internal temperature reaches 140°F on an instant-read thermometer. For salmon the temperature should be about 125°F. Cutting mangos can be a little bit challenging! The long flat seed in the middle is what makes it a challenge so once you learn to work around that it’s easy. This video is really helpful so give it a watch if you are new to cutting mangos. Seedless watermelon is ideal for this recipe as it makes prepping the salsa much easier, however, regular watermelon will work just fine. Be sure you don’t get any seeds in the salsa! If you want to opt for the quick and easy version of the salsa and you live near a Whole Foods you can use their mango salsa and just add watermelon. The taste will be a bit different but it’s still really good! Having an instant-read thermometer is important when grilling as it makes it much easier to check the temperature than taking the fish off the grill to check it. See below for a suggestion for a nice one. Most cooking stores like Crate & Barrel or William’s Sonoma carry several varieties and you can also find them on Amazon. If you’re looking for more grilled fish recipes check out this Grilled Salmon with Mustard Sauce for another easy weeknight dinner option. Olive Oil Sprayer – I love having an olive oil sprayer in my kitchen. It means I can get a nice fine mist of olive oil on things like this before you pop them on the grill. It also works well for a light coating of olive oil on a salad. Fish Spatula – While definitely not a kitchen necessity if you grill fish often this is a very handy tool to own. It’s flexible and has a curved edge that’s designed for lifting fish off the grill with pulling it apart. And at only $12 it’s an affordable kitchen “extra” that will make your grilling life much easier! Instant Read Thermometer – A thermometer like this one is super handy for checking temperatures when grilling or roasting fish or meat. Preheat your grill to medium-high heat. Make sure your grill is clean and well seasoned. In a small bowl mix the watermelon, mango, onion, lime juice, salt and zest. Stir in the cilantro and refrigerate for 15 – 20 minutes while the fish cooks. Pat the sea bass filets dry and brush or spray them with olive oil. Season with salt and pepper. Place fish on the grill, skin side down, diagonally across the grates. Close the lid and turn the grill down to medium. Let the fish cook for 3-4 minutes. Using two spatulas (or a spatula and a fork) carefully lift the fish and make sure the skin is crispy. The fish should lift from the grill easily. If it’s still sticking a bit, let it cook for an additional 30 seconds. Carefully flip the fish over, again placing on a diagonal across the grates. Let cook for 4 – 7 minutes more, until the temperature reads 140°F on an instant read thermometer. Remove the fish from the grill. Top with the watermelon mango salsa and serve immediately. I love this idea so much, especially with the salsa! I’m a huge watermelon fan. Delicious! Love the mango and cilantro. sounds and looks delicious! We are huge fish eaters. Will be pinning!! Looooove a good fresh fruit salsa! This looks absolutely wonderful! The hubby and I used to eat sea bass all the time but it’s been ages since we last had it. I guess we have been opting more for salmon. . .but I think it is time for us to reunite with a little sea bass action. I don’t think we grilled it in the past but I love the idea of the crunchy char on the outside. And this salsa. . .pure heaven if I do say so myself. The flavors in this sound amazing. A fruity salsa over grilled fish is just perfect in the summertime and I really appreciate the helpful tips you gave! Thanks Hana. I’m so glad to hear you enjoyed it! !